An interesting review from Gamer Nexus Gigabyte GTX 1080 Ti Xtreme Review vs. Gaming X (& Backplate Tests), on the default vbios fan settings, seems the Gigabyte is a little noiser than the MSI. MSI Gaming X and Gigabyte Xtreme @ Gamers Nexus added. Palit GTX 1080 Ti GameRock Premium @ Techpowerup added. Gigabyte Aorus @ hardwareLUXX added. Checking purely Techpowerup places Asus Strix and Gigabyte Extreme Gaming at the same on load 33db, with the MSI at 35db. 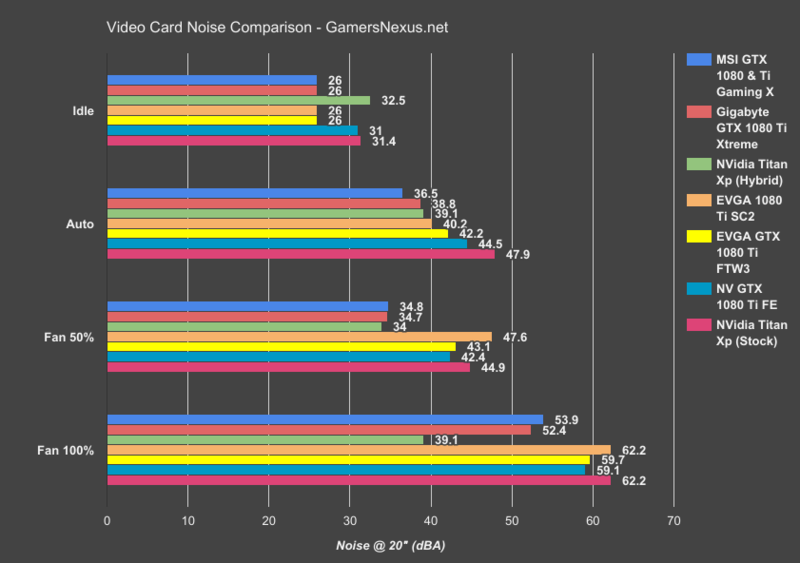 So here Asus and gigabyte are the better options at the same noise, slightly giving the edge imo to asus because of lower temps, so a custom graph might put it quieter. Going by hardwareluxx, places the Asus 40.4db and Gigabyte 40.4db, so give or take even sort of matching what techpowerup found. Then going by Guru3d, places the Strix at 39db, the MSI is 38db and the Gigabyte is 37db, so by this gigabyte is less noisy. Then going by Hexus, the Gigabyte is 35.6db while the asus is 36.7db, somewhat matching guru3d. Going by ComputerBase, the Asus was 37db and gigabyte 38db, meaning the asus was quieter, contradicting hexus and guru3d. Now going by GamerNexus, the MSI gaming is 36.5db and gigabyte 38.8db, concluding the MSI is quieter, even though this contradicts techpowerup and by assumption also the other sites. There is no conclusion i can draw here, one site matches other... then another goes different, no way of concluding which is the quieter card overall. Also this sites test with open benches, most of the time we are going to have worst air circuation, specially us that drop our fans very low, some cards go stupid loud past above their temp targets, things that no one really tests. We really need SPCR to review GPUs. SPCR is mostly dead, Abula, get over it, and all three of us are basically zombies waiting for Godot. Gal Gadot? I'd wait for her. Abula, with these 25-35dB type readings, test environments and equipment, I think the best you can hope for is +/- 1-2dB accuracy and repeatability on results. Hence the differing variances between testers/platforms. You might have to just lump a few in the 'as good as it gets' category for noise, and then select the one with the best temp profile and outputs you need. Added Gigabyte Aorus Xtreme @ KitGuru. How well does it do with 4K gaming? Really depends on the game, but for me the GTX1080 is decent on 4k, the Ti should be around 5-10fps better, look in the reviews posted by Steve, you will find more accurate comparatives between the cards, now a days most sites include 4k benches in their tests, so you can get a better idea into the game you have intended for you 4k setup. Personally im looking more a multiple monitor setup, i would have loved 3x 3440x1440 but its too much even for a Ti, so im playing around with 3x 2560x1080, but will see, im going to to give VR another shot, before committing into triple monitors. 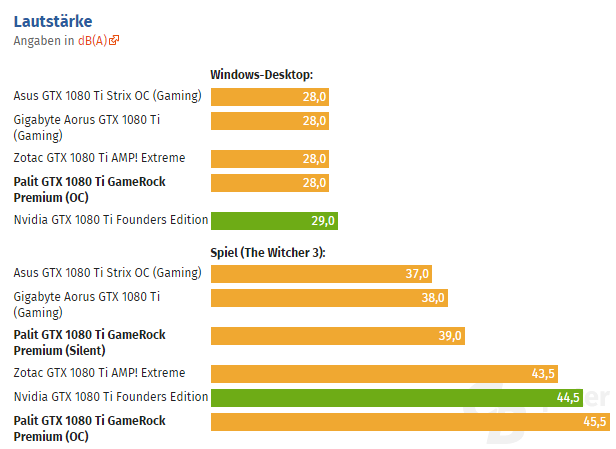 Yes, but according to the ComputerBase, it seems ASUS GTX 1080 Ti Strix is the quietest GTX 1080 Ti on the charts. 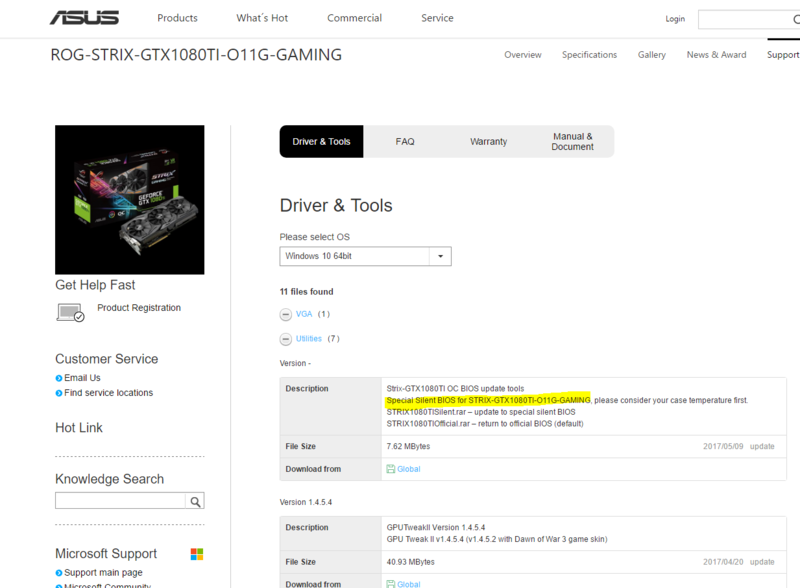 Note that they had a same distortion regarding Palit GTX 1080 Ti GameRock Premium with TPU. Thanks lb_felipe and Steve for the the info. 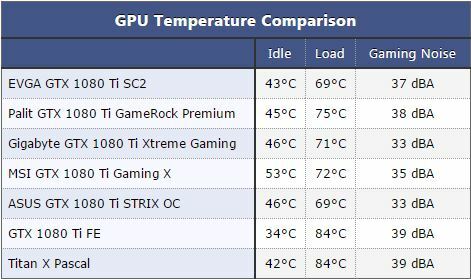 This is by far the hardest time i have had chosing a GPU, in the past MSI was very solid, and probably is today, just the reviews from TechPowerup places 3db louder than Asus, and i see a lot of manufactuerers moving toward triple fans and more than 2 pci slot coolers, so most have upgraded a lot their cooling, while MSI just did a slightly thicker but not that much, considering that there seems there wont be any lightning model, they should have gone all out with a more beefy cooler. But the complexity of chosing the card, not only is because of the reviews are not consistent with each other, some place a card as the quietest, other place another... and so on. But the complexity goes even further because of Asus and MSI chose not to follow nvidia reference GTX1080ti with 3dp 1hdmi, and went 2dp 2hdmi (so they say to favor VR), and in the past this wouldn't have matter at all, i only use 2 DP one for my 4k monitor and 1 for 1080p (portrait mode) for extra stuff to monitor while gaming or surveillance, but this time is different, the pc that im building is really an upgrade to my HTPC that only used to watch movies, but now it will also serve for a SIM RACING setup to run mainly iRacing, this leaves me two high end routes, triple monitors or VR headset, the cheapest route is VR so i ordered a Oculus Rift, that ill probably try in a month or so, but if that doesnt work out (some like it others dont) then ill have to move intro triples, this makes the choosing of the GTX1080ti a lot harder, as it stands atm, Asus and MSI dont have 3x dp, meaning that i cant do triple monitor with 144hz, so if i bet on either is to go with VR. Now on the past, i disliked a lot Asus fan signature, specially on the GTX970s, they become a jet engine if you allow them to reach 2k rpms, MSI is not like that, even at the same rpms is noticeable, but not loud as asus, now most of the reviews we read are on open benches, introducing those cards into cases will very likely raise the temps and thus the noise, and specially for us SPCR fellows, that like to run case fans at very low rpms, the temps of high end cards go at least 10C over what most reviews show, i can increase case fans and be close to what the reviews find.... but at the expense of noise. Now knowing that im going to go up on temps, on the Asus is a gamble to allow it to go to 2k rpms.... so i fear it, specially since i dont like their fans, dont get me wrong, below that the card is acceptable, but idk if im gong to be able to sustain it like that. Now asus do have an advantage over the others, 2x 4pin pwm fans connectors on the card, im planning on modding the Antec SOLO II by opening two 120/140mm holes on the bottom, i can place there a couple of TY147A PWM connected to the Asus GPU, that will run at 300rpms on 0% pwm, so essentially the card will get fresh air from the bottom, and they should increase as the card gets hotter, maybe to the point that i don't reach the 2k rpms on the fans on the card. With any other GPU, i would have to do some more cabling to do something similar. Gigabyte seems like a decent choice also, is the only card that has more outputs, 3dp 3hdmi, allowing whatever for the future, either triple monitors or VR + TV. The card seems decent in most reviews, except on nexusgamers where even the MSI is quieter, also the Extreme edition has had some negative user feedback on newegg not being fully stable, but the reviews from newegg on the none extreme (seems like the same cooler) is almost perfect, and its $50 cheaper with the same outputs, it probably loses some performance, but i also expect it to be quieter since it shouldn't be as hot or needing to cool a higher factory overclock. So atm in stall between Gigabyte and Asus, and still in doubts into if im going to make a mistake.... as an alternative im also considering going with a Founder edition and going full water with another case, just didn't want to spend that much on this build, so still thinking if i can avoid this. Also considering stalling the build for VEGA, there are some rumors that the card might be between GTX1080Ti and GTX1080, so it might be worth the wait if the pricing is good, maybe this time the reviews are more consistent into what card is quieter. AMD might be a good choice here because of Freesync, most monitors are coming out with it, while a very few and much more expnesive come with gsync, there is an LG 34'' 3440x1440 144hz coming Q3 2017, and if you see all the past LG releases, all are freesync, so its very likely that AMD card would be a good choice if the LG monitor is to be chosen, but i also have my doubts into moving 3x 3440x1440, that resolution is 78% more than 4k, cards are barely starting to sustain 60fps on 4k.... so its very unlikely that those monitors will be able to be ran with VEGA above 100fps. Aorus Xtreme @ Tech Report and Zotac @ Techpowerup added. One interesting thing to mention on this review is the 40db comparation between the cards, meaning they push the fans until 40db are reached and then they measure temps to see who is more efficient releasing the same noise. Asus @ Gamers Nexus, Palit GameRock @ Guru3D, and MSI Gaming X @ Tom's added. Maybe that's why ASUS has promised to release a "quiet" BIOS soon, which will change the fan configuration to run at lower noise with slightly increased temperatures. Will see in a month or two how it end up. Best of luck to you - I know it's been an agonizing journey. Damn it, Abula. I came to post this here. But I see that you were faster. Congratulations. It is quiet with 33 dBA, but I think it could still be quieter given temperatures are so low. It seems ASUS focused slightly more on delivering lower temperatures than low noise. This is certainly an opportunity for MSI and their Gaming cards, which consistently delivered outstanding noise levels in the past. Maybe that's why ASUS has promised to release a "quiet" BIOS soon, which will change the fan configuration to run at lower noise with slightly increased temperatures. Thanks lb_felipe for all the effort and information, really appreciated. I have posted to NexusGamer and Techpweroup forums to see if they still have to card to test them, but its most likely they already ship it back to asus, so i decided to take the gamble, once B&HPhoto stocks it ill order it, im expecting to be this week or early next, but im also ordering a Seasonic Prime 650W PSU so since it weights to much ill be sending it by boat, so in a couple of month max i should be testing it. Ill probably not do the flash initially, im going to test it with the standard bios and see how the card behaves, specially under low rpms on the SOLO II, if the card don't hit 80C+ ill probably flash the bios, else ill keep it as it is. My expectations is that most review sites only test open bench, thus lower temps, i think inside the case, its going to rise 5C at least, probably 10C running at low rpms, but will see upon testing, ill be modding the solo II some to have a better chance at it. Thanks Steve, i still have my doubts into the tone on the asus fans, but i also want to test the extra 4pin connectors and adding 2x TY147A on the bottom of the solo II, ill be modding next weekend the case to send the custom cardboard to DemCfilters, probably ill get the fan filters by the time the PSU and video card arrives. This is going off-topic, but I gotta know...With your mods bringing the potential for high volume/low rpm inflow air, What are you going to do about outflow on the Solo II? It's not the case I'd go to for low impedance airflow and a 250W gfx card. Well its basically what the FT05, lots of air in forced by fans, and not much fans getting air out on fans, should go out on positive pressure of the fans getting air in, so in essence air should follow other spaces to get out, the grills on the PCI brackets, the PSU and in this case, the top PSU vent. But as we seen in the past, there are diminishing returns on more than 2 fans... this is more to try to keep the GPU under the least noise possible, trying to get fresh air directly to the card by adding two 140 on the bottom. I know the SOLO II is not a great airflow case, and probably not ideal for the GTX1080Ti, but today is not that easy to find a case with top PSU to have space on the bottom to add fans, most focus on adding 120/140 fan mounts on the top for watercooling/aio coolers that to me dont net much, so im going to try to make the solo a little better.... weather i succeed or not, only time will tell. If it doesn't work out, i still have a R4, but i somewhat doubt will be much better. The other case that i was thinking was Corsair Air 540 modding the bottom, but it it will be harder as the bottom is not even, i would have to do a custom plate and bolt it to the case. Ok. understand the premise...have doubts, but hope you succeed. EVGA SC2 ICX @ Hexus added. Gigabyte Aorus Xtreme @ Tom's Hardware added.